I always tell you when certain places blow my expectations away. But I also have to tell you about the places that I was disappointed by. 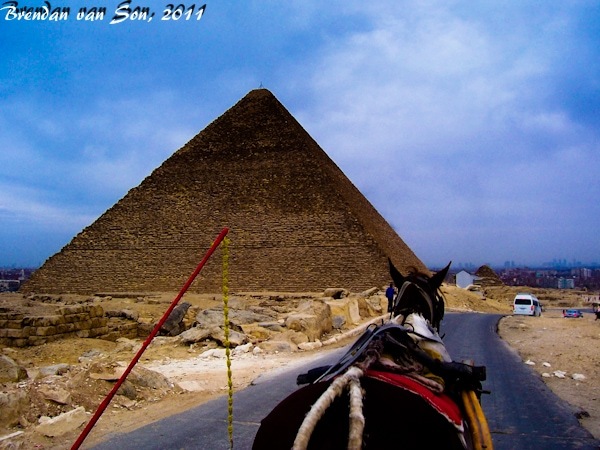 The Egyptian Pyramids, in my opinion were over-rated. I think that the pyramids in Central America were far more impressive. And although The Sphinx was very cool, it really didn’t blow my mind like I had expected it would. Luckily, I had a great experience. I visited with my university roommate, who is from Cairo, and we jumped on a couple of camels. After wandering through the town on the way to the pyramids we arrived near the gates at which point I was pick pocketed. I had nothing in my wallet of real value but we chased the thief through the streets by camel back only to lose him. The race of the camels was too much, and we could barely walk afterwards. Thus we decided to go into the site by horse and trailer, which was much more comfortable. The site might have been over-rated in my opinion, but the experience was what is made one makes of it. And we raced around the site taking goofy pictures for hours, and had an absolute blast. I shot this on my old 5MP point and shoot camera while riding the horse. I like the perspective of the shot, and if there weren’t a couple cars in the background it would probably have a classic old look. Why were the Eygyptian pyramids not as impressive as those in Central America? 1) To me they looked like an over exaggerate pile of rocks. 2) They are backdropped by the smog of the sprawling city of Cairo. I mean, it’s possible to get a shot of the pyramids from KFC. The pyramids of central america were just so much better put together. Just a matter of opinion though, I’m sure many people will disagree with me. Zeeeeeeks!!!!! Gassius Clay and Benji Rollin’ on Eyg. I have photos of that too. “Not today Not today” P.S. I did the famous penguin walk while in Atarctica, again running away from a seal. Keep doing what you doing Max, looks like you are having an awesome time and enjoying life. You just need to settle in a country long enough so that I can come and visit sometime. I am going to be in Colombia for a while now, maybe 4 months. Come and visit… we can definitely find some trouble to get into here.